Beduinos Royalcorona, under jockey Kevin Carbajal, was an easy winner in the Turf Paradise Maiden Stake (not black type) on Sunday at Turf Paradise Race Course . PHOENIX, AZ—FEBRUARY 10, 2019—Beduinos Royalcorona cleared the field on the way to his first career win Sunday afternoon, defeating Tubac Royale by 1-½ lengths in the $5,000 Turf Paradise Maiden Stake (not black type) at Turf Paradise Race Course in Phoenix, Arizona. Gonamakeureyesblack finished half-a-length back in third. Ridden by jockey Kevin Carbajal, Beduinos Royalcorona completed the 350 yards in :17.793 seconds, earning a 94 speed index into a 7 mph crosswind. It was the first career win for the 3-year-old son of leading living sire Corona Cartel. Trainer Guillermo Morales saddled the brown gelding in his first career start, outside of Los Alamitos Race Course, for owner ABA Quarter Horses, LLC. Bred by California by Abigail Kawananakoa, Beduinos Royalcorona has compiled a (10) 1-1-2 record and today's winner's purse of $3,969 boosted his career mark to over $10,100. He is out of the Strawfly Special mare Straw Flying Lady. Runner-up Tubac Royale picked up $1,280 for owner Jessica Pinedo. Phil Pinedo conditions the Flair For Dancing Arizona-bred from the Thrown A Fit mare Spectacular Fit. Eddie Megariz is the breeder and Rick Oliver had the riding assignment. Owned-trained and bred by Eloy Mendoza, Gonamakeureyesblack earned $640 for third. 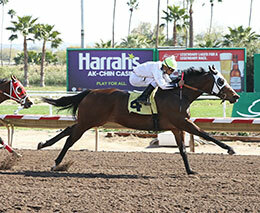 Jockey Emilio Tapia rode the New Mexico-bred gelding by Gonnamakeyoureyesblue out of Hawaii Calls by Willie Wanta Dash. Kook Kat, Long Colt, Toretto, West Coast Eagle and Zuzu completed the field.